According to a report released yesterday by Samidoun, The Palestinian Prisoner Solidarity Network, Mahmoud Sarsak is at grave risk of death on his 85th day of a hunger strike against his three year detention by Israel. The 25 year old Palestinian soccer star was abducted by Israeli forces in 2009 while traveling from his home in Gaza to the West Bank in order to train with the Palestinian national soccer team. Since, he has been held without charge or trial under Israel's "unlawful combatants law." Sarsak began his hunger strike on March 19th, 2012 after the strikes of Khader Adnan and Hana’ Shalabi, who were similarly held by Israel without charge or trial. 84 days in, according to Physicians for Human Rights and Addameer, "He has lost 33 percent of his body weight, from an original weight of 76 kilos down to his present weight of 51 kilos. He also suffers from frequent incidents of fainting and loss of consciousness, in addition to lapses in memory. The doctor further reported that Mahmoud is in danger of pulse disruptions (arrhythmias) that are endangering his life." Despite his dire state, Israel refuses to transfer him to a civilian hospital for treatment. Palestinian human rights organizations have called for international action and solidarity with Sarsak and his fellow hunger strikers, including Akram Al-Rikhawi (57 days), and Samer al-Barq (22 days). In a letter from Sarsak and Al-Riljhawi to the public, the strikers asserted "we will remain on our strike until all our demands are met and we will not submit to the demands of the Prison Service regardless of what we suffer...," but appealed for international support, stating "there is still enough time and the support that comes late is better than that which does not come at all. It is better that you receive us alive and victorious rather than as lifeless bodies in black bags." Sarsak's family has also released a video calling for his freedom. 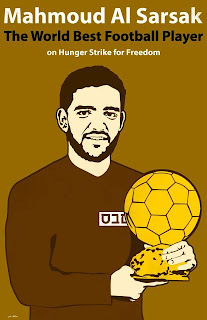 Please take this opportunity to stand up for justice for Mahmoud Sarsak and all Palestinian political prisoners! 1. Sign a letter demanding the Israeli state transfer Mahmoud Sarsak, Akram Rikhawi and Samer al-Barq immediately to hospitals and release them. Tell the Israeli Prison Services that the world is watching! Click here to sign. 2. Call the office of Elizabeth Jones, Acting Assistant Secretary of State for Near East Affairs at the US State Department (202-647-7209) and demand the US intervene on Mahmoud Sarsak's behalf by asking Israel to release him immediately. 3. Tweet this to the State Department and Barack Obama letting them know that it is time they stand up for Palestinian human rights.